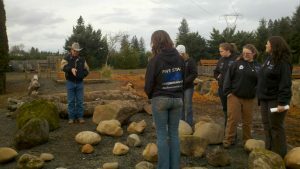 With a little know-how, a rock obstacle is easy to construct and easy to master. I love this obstacle because it teaches a horse to slow down and think. It will teach the horse to carefully pick up and place its feet and also to think its way through. It’s a practical and useful training tool that almost anyone can construct (with some help on the heavy lifting). be the size of soccer/ basketballs. In addition, the obstacle should also feature a few very large rocks. This challenge takes up a small space and can be sized from 12-20 feet wide and from 20-40 feet in length. I like to define the obstacle by elevating it from the surrounding area and by using poles, logs or rocks to mark its corners. To master the rock obstacle, I always start from the ground and send the horse through. Make sure that you have the Bolender Bubble clearly established so the horse will not attempt to come out of the obstacle into your space. Concentrate by sending the horse through the obstacle and allow it to take time and think it through. Expect the horse to use its mind! Do not try to micro-manage the horse as to foot placement. The instinct of the horse will help guide it through and this is better without human interference. If the horse rushes through, demand that it slow down or make sure that it maintains focus on you so it does not rush and injure itself. Once the horse learns to think its way through and will carefully place its feet, then allow it to navigate the obstacle at its own pace. If you encounter problems, back up and slow down. One way to back up this process and take it slow is to find a corner and have the horse walk through just a small portion of the obstacle. Do not try to force the horse for it will feel the pressure and revert to the instinctual mode of reacting and then thinking. This is not good for the horse and can result in injury; we have a great responsibility to protect and teach the horse. When the horse is comfortable walking through the obstacle then it is time to ride. When in the saddle, take your time and do not try to force the horse through. Some horses are much more comfortable going through the obstacle when they can focus on the person, but when you are in the saddle these types often lose confidence. Start by asking your horse on a soft supporting rein. 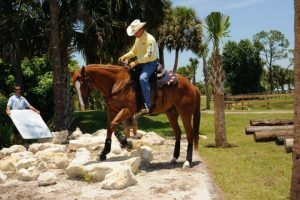 You must have the skills to allow the horse to drop its head, while maintaining a feel of the tongue, and be able to work the rein to help the horse and reassure it. If you are scared or nervous then have someone else ride the horse initially. A horse can feel a rider’s nervous heart beat and will become nervous itself. In the beginning, ask the horse to just walk through a few rocks along the corner of the obstacle. Build from this small step until you can walk the horse down the middle of the obstacle. When the horse is very comfortable walking through the obstacle you can begin to fine-tune your execution and become even more specific. Mastering this obstacle will include the horse walking up to the rocks, dropping its head and acknowledging the obstacle and stepping into it without breaking gait. The horse should walk the straightest possible line through the obstacle, without touching a rock, and drop its head while stepping out of the obstacle in a nice forward, yet collected, manner. Happy Trails and Bolender Blessings!